The classic car hobby can be very enjoyable, but do you know what to do in the event of an emergency? Every year, I am sad to report, fires happen with old cars; however I am glad to report that with basic maintenance to your vehicle most of the time they can be prevented. In this month’s article, we will look at some safety tips for you and your vehicle. When dealing with a classic car, should the unthinkable happen and a fire ignites, it is usually fueled by one of a variety of things: gasoline, a short in the electrical system, an oil leak, or even leaking power steering system. Many of us that are familiar with the Studebaker flathead engine, or just about any Studebaker engine, will know what I’m talking about here: the fuel line going to the carburetor sits above the spark plugs and in front of any wires on the firewall; And just about every Studebaker has a metal gas line that is connected to the carburetor with a rubber hose. If that rubber hose is old and beginning to crack, it can leak gasoline onto the spark plugs which can start a fire. Gas can also leak onto the wiring harness and distort the wire sheathing, which can ultimately cause a short. At the beginning of every spring, make it a point to check your fuel lines. If the rubber hoses are beginning to crack, don’t hesitate to replace them. Also check your wiring harness for any broken or frayed wires which can cause a short. If the wires are bad, replace them or the entire harness if necessary. The SDC recommends that every Studebaker be equipped with a fire extinguisher, but they don’t really say what kind. You want one that is small enough to carry around and easy to handle incase you need it, but at the same time capable of extinguishing every part of your car. (i.e. fuel, electrical, rubber, and upholstery/vinyl.) So, in a nutshell it is recommended that you carry an extinguisher of approximately 2lb and rated to extinguish all type A, B, C, D, and E fires. It will say that directly on the extinguisher bottle and they can be bought at just about any major retailer. These car type extinguishers are usually filled with a dry chemical that will smother out the fire and make less of a mess than foam. There is also a type of fire extinguisher that you do not want to carry, and we will discuss that later in the article. If the fire is small, remember to aim the extinguisher at the base of the flame and put it out in a sweeping manner. It is also strongly recommended that every Studebaker be equipped with seat belts. Remember, you will never be docked points for having a fire extinguisher and seat belts when having your car judged at an SDC event. The number one thing not to do in the event of an emergency is PANIC. Use your best judgment to control the situation, then call 911. WHERE TO PLACE YOUR FIRE EXTINGUISHER IN YOUR CAR. Your fire extinguisher should be positioned in a location that is not a hazard, like being too close to your legs, but at the same time you have to be able to grab it at a moment’s notice. The best place to keep an extinguisher is either bolted to the kick pads under the dash, or to the floor next to your center console if your car has one. It should also be somehow fastened to your car with a quick releasing clip; not rolling around. THE TYPE OF FIRE EXTINGUISHER YOU DON’T WANT. This part of the article is a bit of a public service announcement to a trend that I believe needs addressing. In recent years I’ve seen that some classic car owners like to keep ANTIQUE FIRE EXTINGUISHERS. 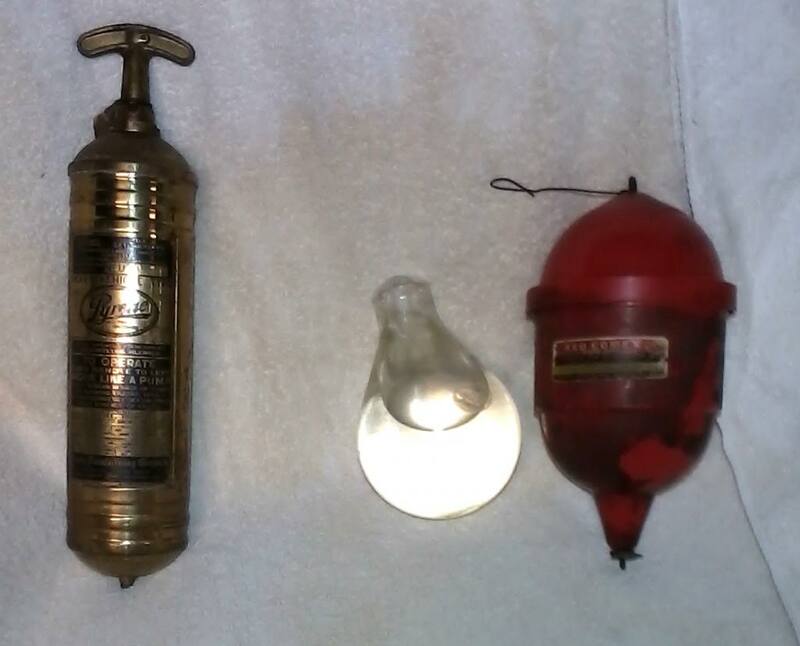 Antique fire extinguishers can be bought for about $15 on Ebay and even though they look cool, YOU DON’T WANT ONE. An antique fire extinguisher does not meet current safety standards, and worse yet the vast majority of them contain a chemical called Carbon Tetrachloride, or CM7 for short. 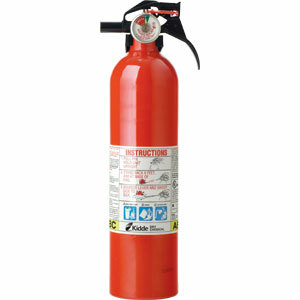 CM7 used to be used in fire extinguishers because it does do an effective job of putting out a fire. The problem with it is that when it comes in contact with fire it makes mustard gas. PLEASE DO NOT USE THEM, EVER. One of the other dangers in the old car hobby is the danger of CO (Carbon Monoxide) poisoning from a bad exhaust pipe. The exhaust is another part of your vehicle that should be checked every year. A rust hole in an exhaust pipe can leak exhaust fumes that contain CO , which has no smell but is toxic. Symptoms of CO poisoning are a sudden tiredness and slight upset stomach and headache. Another thing that the SDC will not dock your vehicle for in points is equipping your car with a stainless steel exhaust system which will not rust. Any exhaust shop can install a new system, and a good supplier of stainless steel exhaust pipes for Studebakers is Don Simmons in Canada. Another thing to check is your windshield wipers. If you are like me, you usually don’t drive your Studebaker in a rain storm unless you get stuck in it; but regardless make sure you have good wiper blades. Impaired vision is a major cause of automotive wrecks every year. Studebaker International keeps reproduction windshield wiper blades in stock for just about every model of Studebaker. Tires can also be dangerous if not properly maintained. It is recommended that no tire should be used for an extensive amount of driving if it has less than 1/8” of tread or over ten years old. Tires can also dry rot which can cause a blowout. Also remember to keep your tires properly inflated. The point of this article is not to scare anybody from driving their cars, but just a reminder so you know what to do in the event of an emergency before authorities can get there; and how to prevent an emergency from happening in the first place. Stay safe out there, and see you on the road.